We would like to give a huge shout out to Mennat’s wonderful team of ladies. They were all amazing! They were there with my family and I from start to finish. With those adorable outfits, it was so easy to spot them out in the crowd, along with all the suppliers she suggested everyone did a spectacular job! I loved the ENTIRE team! We cannot recommend Cloud 9 enough they are not only professional and amazing at their work but they are so kind and caring that you really feel like you’re working with family. We wanted a fairytale wedding and it came true thanks to Cloud 9. A great team that is cooperative and helpful. They offered ideas that matched our imagination and worked very well around our budget. 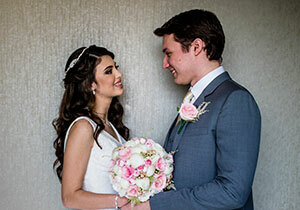 Our guests’ feedback being “wedding of the year!” is credited to their hard work. Thank you Mennat! Cloud Nine Events went above and beyond our expectations for our wedding on September 20th 2014. Ms. Mennat was very considerate, easy to talk to and fun to work with and no detail was left un-discussed or unexplored, resulting in a very pleasant and low-stress atmosphere, absolutely highly recommended!! Thank you for organizing our special day. We loved everything you have done and seeing it come to life was absolute Magic! You captured our personalities and put it into the wedding! Everyone keeps talking about how cute, cosy and detail oriented the wedding was (which is what we wanted) and more importantly, how it was SO US! Muchisimas gracias, te lo agradecemos con el alma. Many thanks to Cloud Nine Founder Mennat for planning my crazy Hen Party! The evening was spectacular and filled with unique surprises. Never think twice about booking Cloud Nine for your next event, the team will make the unthinkable come true! Thank you for personalizing our matchboxes- they were super cute and everyone appreciated them! The Cloud 9 team will make your next event a true success! We have the know how and can offer anything from design, branding, and entertainment to execution and on the day coordination. © 2014 Cloud 9. All rights reserved.